In my previous post describing a sales funnel development case study, I described a particular client that came to us to help them improve the conversion rate of website visitors. I also explained what steps we took to figure out what the problem of the website was. If you haven’t read Part 1 of Perfecting Your Sales Funnel, please do so now! The first thing the user sees is a beautiful display of imagery in their three specialty areas; Kitchens, Basements, and Bathrooms. The visitor is also exposed to those precise keywords at the top which confirm what they are looking for. The visitor is then able to focus on the box that is of interest to them. In my case, I will pick ‘Kitchens’. I read further in the ‘kitchens’ box; “Interested in your dream kitchen? We can help!” Then I am given the option to “Get Started”. Does it get any better? 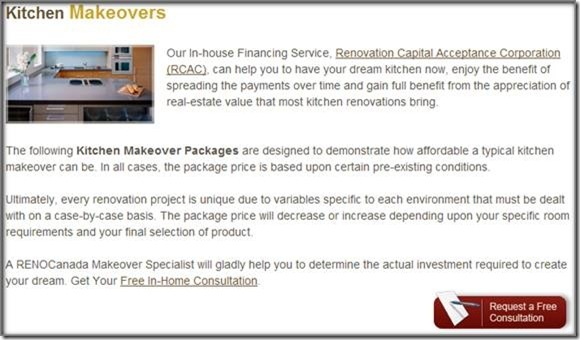 I am redoing my kitchen and the ‘core site message’ has told me that RENOCanada offers exactly what I was looking for! The chances of keeping the visitor past the five second decision making period has now dramatically increased! 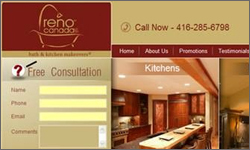 I click on ‘Get Started’ so that I can see what RENOCanada has to offer for my new dream kitchen. The next page is what we refer to as the ‘goal page’. The purpose of the ‘goal page’ is to provide the visitor with enough information and ‘calls to action’ to persuade them to follow through on the overall goal of the website – to persuade the visitor to leave their contact details with the company so that someone can follow up and close some potential business. 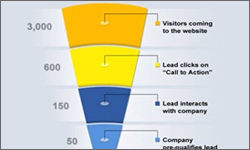 There are 3 components or sections within the ‘Sales Funnel Goal Page’. The purpose of this page is to appeal to three different types of website visitor type:. The ‘Glitter’ Visitor – Found in the top banner of the goal page, this visitor should see dramatic imagery, calls to action to persuade the user and a mode of contact. The ‘Fine Print’ Visitor – This 2nd section of the goal page outlines the finer details of your product/service and usually provides greater detail to the offer provided to the ‘Glitter’ visitor. The ‘Kitchen Sink’ Visitor – The ‘Kitchen Sink’ visitor is sometimes either a skeptic or hard shopper. This type of visitor needs the ‘kitchen sink’ thrown in (no pun intended). So we create a section with an unbelievable offer! The inside or ‘goal’ page appeals to all 3 visitor types and keeps the visitors attention. The purpose is to reel in the ‘Glitter’ visitor, and to urge to the other two visitor types to continue on. An image of an attractive ‘dream kitchen’. An engaging message which helps alleviate any concerns. You will then notice a ‘Free Consultation’ form which speaks to the visitors more outwardly that RENOCanada is waiting and ready to interact with the visitor. There is also a Request Information button which opens a form for users that are not provoked by the form. Finally at the top of the page you will notice a ‘Call Now and phone number’ call to action giving the visitor the feeling that someone is available to take their phone call. In short, the visitor is once again given every opportunity to understand who RENOCanada is, what they offer and why the visitor should contact them. The ‘Glitter’ Visitor who already has a rather short attention span is now ready to stop their search and commit to learning more about the company by leaving their information for a call back. A lead is generated! Are you the type of person that reads all the details before you ‘sign a contract?’ (or even skims?) Are you the type of person that sometimes thinks there is a catch to things? Are you the type of person that reads the instructions before putting things together? Then this is the section of the Sales Funnel Goal page that will appeal to you. Sometimes considered a ‘skeptic’ and sometimes just a ‘detail oriented’ person, it is important to appeal to the ‘Fine Print’ visitor by providing details! The second component is all about detail and that detail must relate to the top banner or the ‘core site message’. This will satisfy the ‘Fine Print’ visitor who is usually interested in the ‘meat in the sandwich’ instead of just the presentation of the ‘meal’. In this section it is important to write effective content which details the messages you provided to the ‘Glitter Visitor’. This detail should expand on the flashy information and one liner’s that were placed in the top banner. Of course, we also want to make sure that we provide the ‘Fine Print’ visitor with an opportunity to offer their own seal of approval by offering them a ‘Request Information button’, which will once again mean another successful visitor is converted! Of course, for some visitors that still isn’t enough. They need to be overwhelmed before they are going to throw the towel in on further research. That is why we develop our final ‘Goal Page’ component just for the ‘Kitchen Sink’ visitor. Ever watch those late night infomercials with the steak knives that will cut through everything including metal? If you are a ‘Fine Print’ visitor then you need to know how the knife cuts through metal and better yet, you want to see it in action. The ‘Kitchen Sink’ visitor is the visitor that is interested but only buys the product once the guy making the offer at the end of the show tacks on an extra set of steak knives, the tomato core remover and ‘Norman’ the extra large butcher knife – all FREE OF CHARGE! 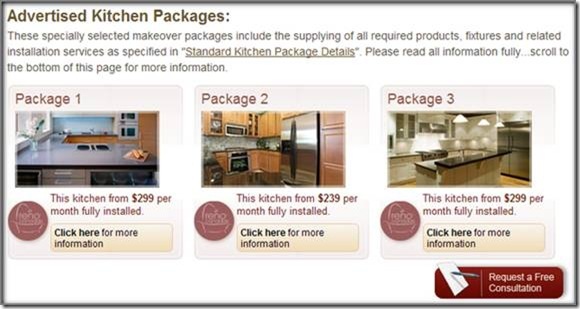 The final step in converting your website visitor is offering the ‘Kitchen Sink’ visitor something more. In this case we are showing the website visitor the special packages that are available. We are allowing the visitor to click to have a pop up open to reveal more information. These packages are exactly what the ‘Kitchen Sink’ visitor needs to be convinced to make the ultimate commitment and that is to press the “Free Consultation” button which just so happens to be located conveniently at the bottom of the page. All website pages and especially the ‘Sales Funnel Goal Page’ needs to have somewhere at the bottom of the page to lead the visitor. Otherwise you are trapped at something I call a ‘Dead End Page’. As an internet marketing company, that is where our job lies; to not only build traffic to the company website but also to provide guidance on the creative aspect of the site to help develop and improve conversion rates once the visitor is at the site! In short, a strong internet marketing company should be interested in the core reason your company is in business, and then help you to develop a ‘core site message’ before even considering to begin driving traffic to your site. Otherwise, you will be wasting a great deal of revenue sending traffic to a site that isn’t converting as well as it should. The final component that an internet marketing company should be helping you understand is the results of that website traffic and also giving evidence of how your website is converting. This can be done by measuring your website traffic and also helping you manage your leads. A good internet marketing company should build you a web property that converts traffic, promote effective ways to send targeted traffic to your site and helps you understand the effectiveness of this work. how you can go about measuring everything online (and offline) today to determine whether your marketing dollars are being well spent. some intuitive hints helping you close the sale once the sites goal of bringing you leads has been realized. These segments will be posted in the next week so make sure you subscribe to our feed to be up to date with our latest posts. If you have any comments that can help make this article even more useful or if you think I missed anything or if you just want to tell me if this helped you, please post them in the comments section below! Some great points and illustrations in this 2-part post. Allowing the visitor to interact with the website on the very first page he encounters is invaluable. Thank you! That is wonderful news Lisa. The point is that in this industry everything we do can be validated by numbers. So we have the benefit of making changes and seeing what works and what does not. Its a wonderful thing! In the end the purpose is to really give the visitor what they want to see! DJ, I was speaking with one of our PPC clients. We are driving traffic to his site through PPC however there were no conversions. When we checked his landing page it was very busy. Once I demonstrated the concept of the sales funnel and he wants to us to develop a new sales funnel landing page for him. Simple idea that speaks volumes!!! This is obviously one great post. This topic is new to me and i consider it as a very interesting facet of web development. Thanks for the valuable information and insights you have so provided here. Keep it up! That was a very in depth case study DJ! Guess this is one for the reference manual for many. Yes, fundamental to the success of many Internet companies is the concept of sales funnel. In an increasingly competitive marketplace, sales funnel can give companies a clear idea as to what a customer is worth in the long term. And this will help them to carve a niche and be a step ahead of the competition. Sales funnel is thus key to any internet marketing campaign and should be paid proper attention to. Fantastic article DJ. Never went through such a detailed article on sales funnel. Both parts of the article are great material published on web and it help me a lot to better understand what is sales funnel and how is it important and how we can improve it. It was very helpful and can be perceived as a cornerstone on our website! This is the most amazing compilation of knowledge that Ive ever encountered on such a topic. Your effort is much appreciated. Very rich article and very well researched, full of resources & information. And I really enjoyed the use of pictures to support the content. Thanks DJ for putting it together! The very idea seems provoking. Yes, you’re damn right, the design attracts clients and entices them to visit the site or make purchases. I would like to add – internet doesn’t provide us a magic carpet that can help us market some program, product or service and guarantee overnight riches; instead each site should find its sales funnel and core messages to keep them in business. Pretty interesting information, well-explained. Thanks DJ! Your blog has a nice appearance, it loaded quickly, was easy to navigate, and no missing or broken links. Pretty clean! Providing lots of good and fruitful information on a regular basis. All pulls me visit again and again :D.
This article on website design, development and sales funnel should serve as an eye opener to everyone who feels that their websites are not driving in traffic or making money. This is a successful model for everyone to follow. This is very interesting and you have given a crystal clear picture on how the sales funnel works. Essentially all websites are meant to be answers to something. If our visitors are a little more search engine savvy (can they be included under kitchen sink :)), they always look for the straight and clear core message. We get the core message by identifying the essence of company’s existence. Am I right? 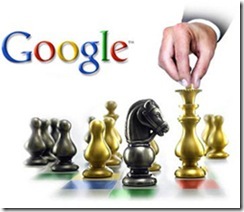 What an informative and educative SEO article from an internet marketing stalwart. I feel keeping this article as a guide, I can very well design and market a very effective website and attract immense traffic to my website. Hope to see more of such SEO articles. There is a Chinese proverb which states’ 1 picture is worth 1000 words.Your article with picture of a website showing how a core site message needs to be highlighted and the step by step process to be followed in developing an effective website is extremely useful for all SEO personnel. It is educative and drives the point home.